MANILA, Philippines - True to his word, President Rody Duterte came to support our national athletes and was honored to do the ceremonial toss. But the President’s presence wasn’t enough for the Philippines to upset France during the opening day of FIBA Olympic Qualifiers Manila leg. Le Bleu beat Gilas Pilipinas, 93-84 on July 5 at the Mall of Asia Arena in Pasay City. When France Men’s National Basketball Team roster was introduced by the coliseum announcer, Charlotte Hornets forward Nicolas Batum was spotted on the sideline sans his Le Bleu uniform. But still, the 5th-ranked team in the world has 5 more NBA players in the lineup led by veteran point guard Tony Parker and enough to handle Gilas 4.0. Height is might, as team France won the opening tip but Andray Blatche, Gilas’ naturalized player snatched the ball from Tony Parker for a breakaway two-handed slam dunk and drew the first blood. Parker atoned his mistake for quick 5 points. Coach Tab Baldwin, before the game started said that his boys can’t afford to let France getaway from them early in the 1st quarter. With this words, Gilas boys maintained their lead through the efforts of Andray Blatche and Jeff Chan. The former Brooklyn Nets center sizzled hot in and out and chipped in 12 big points with 5 more minutes left in the first. 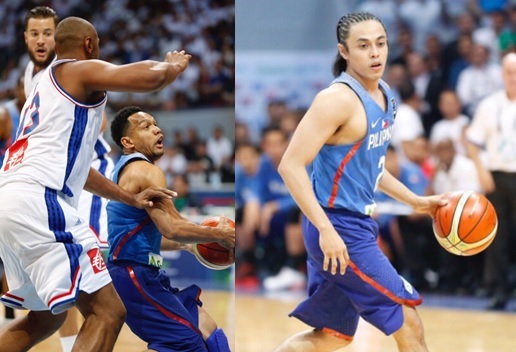 Terrence Romeo entered the floor sporting Allen Iverson’s signature cornrows hairdo. Romeo immediately showcased his dribbling skills and humiliated France’s team captain Boris Diaw who clipped him while taking a three. Romeo however, only made 2 out of his 3 bonus points. France surprisingly blinked first during the game as Coach Vincent Collet called a ceasefire after Terrence Romeo’s back-to-back baskets which gave Philippines its first double-digit lead 28-18. After 10 minutes of nail-biting basketball action, Gilas Pilipinas unbelievably led France 30-22 entering the 2nd period. Another NBA veteran, Nando De Colo, tried to catch-up with his hot shooting hands at the start of the 2nd quarter and managed to cut the lead to just 3, 32-29. Alarmed by France’s scoring surge, Coach Baldwin sent Andray Blatche and Jayson Castro-William back on the floor. The Asia’s best point guard brought the lead back to 8 with two quick baskets and one. Coach Baldwin took his turn to call a halt after seeing too much of French scoring assault with 4 more minutes remaining in the half. It was really Nando De Colo along with Joffrey Lauvergne who brought France back to the game. But after staying most of his time on the bench, Tony Parker rang the bells from the outside and trimmed Gilas’ lead to just 1 point. Boris Diaw tied the ball game at 41 apiece after getting fouled by half-filipino half-french Jean Marc Pingris and sank 1 of his 2 free throws. Tony Parker saw an opening in the middle to finally grabbed the lead after almost 20 minutes. Terrence Romeo hit a buzzer beater jumper to close the 1st half with Gilas behind by 2 points, 45-43. Nando De Colo continued to score in the opening of the 2nd half. He made quick 4 points together with Tony Parker’s 2. But Jeff Chan was too quick to react with a rare back-to-back three pointers. With 6 more minutes in the third, Parker has silently contributed 17 markers and brought his team’s lead up to 8, 52-60. Aside from Parker and De Colo, their reliable big man Kim Tillie added more fire power to Le Bleu. Tab Baldwin has seen too much damaged to his team with 3:10 left in the penultimate quarter. His wards were down by 13, 69-56. Blatche and Romeo tried to revive Gilas by cutting the deficit to just 9. Unfortunately, Blatche committed his 4th personal foul that forced Coach Baldwin to pull him out of the court and sent June Mar Fajardo in to man the middle. 3rd quarter ended and France was still up, 77-66. Gilas had the first position in the final period but it was a waste after Terrence Romeo promptly took an airball three. Romeo avenged himself by hitting a corner trey combined with Ryan Reyes’ own version of triple to cut the lead to just 7. Coach Collet called a timeout to regroup his team and to prevent Gilas’ scoring run. Romeo added more three markers after getting fouled by Florence Pietrus at the three point territory. With Romeo’s three charity shots, the Philippines were just behind by 6, 81-75 with 6 more minutes remaining in the last quarter. Just as Philippines was getting its momentum, Mickael Gelabale stepped on the gas and scored 2 consecutive shots to escalate the lead back to 10. The crowd went crazy as Gilas got back on their feet and slashed the lead to just 4 courtesy of William, Rosario and Norwood. But not for long, as Tillie and De Colo pushed back to 12 with less than a minute left in the ball game. 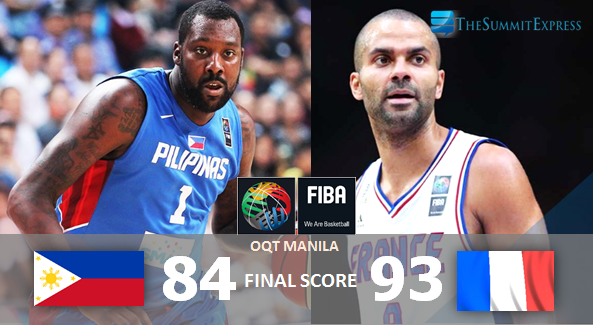 The French ballers hurt Gilas and millions of Filipinos for winning their face off 93-84 after 4 intense quarters. Gilas will play New Zealand tomorrow at 9:00pm for a do-or-die game. If Philippines beat New Zealand, Gilas will move onto the semifinals not unless the Kiwis upset France in their match-up on Thursday.